"A discovery of this magnitude could have only happened in Hawaii," said Dr. Steve Mairs, astronomer and lead investigator of the team that discovered the stellar flare. "Using the JCMT, we study the birth of nearby stars as a means of understanding the history of our very own solar system. Observing flares around the youngest stars is new territory and it is giving us key insights into the physical conditions of these systems. This is one of the ways we are working toward answering people's most enduring questions about space, time, and the universe that surrounds us." 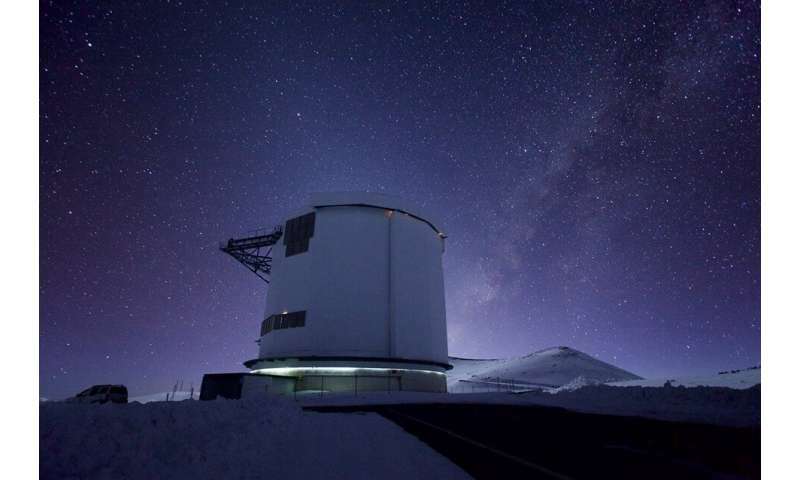 Located near the summit of Maunakea, the JCMT is the largest and only telescope in the northern hemisphere capable of making this type of discovery. The stellar flare observation was made as part of a monthly tracking program from researchers from around the world who use the JCMT to observe nearly 1,000 nearby stars in the earliest stages of their formation. FWIW, I remember long and oft-bitter arguments over chrondites & chrondules, as their thermal histories seemed to need immense blasts of energy to re-work components. Much thought was given to triboelectric processes, magnetospheric shock-fronts etc etc, as sufficient input from even a big solar flare seemed implausible. "Although chondritic asteroids never became hot enough to melt based upon internal temperatures, many of them reached high enough temperatures that they experienced significant thermal metamorphism in their interiors. The source of the heat was most likely energy coming from the decay of short-lived radioisotopes (half-lives less than a few million years) that were present in the newly formed solar system, especially 26Al and 60Fe, although heating may have been caused by impacts onto the asteroids as well. .... In addition, all chondritic asteroids were affected by impact and shock processes due to collisions with other asteroids. These events caused a variety of effects, ranging from simple compaction to brecciation, veining, localized melting, and formation of high-pressure minerals. The net result of these secondary thermal, aqueous, and shock processes is that only a few known chondrites preserve in pristine form ..."
"Flash-heating from X-rays is a possible explanation for producing chondrites (Shu et al. 1997) and abundances of calcium-rich inclusions seen in meteorites (Sossi et al. 2017)." "flare 10 billion times more powerful than those on the sun"
Wow! That's even worse than my wife when I leave the seat up!